Carnivarious vulgaris and Accelerati Iicredibulis. If one of these two appeared, they’re in this category. Directed by Chuck Jones; Story by Michael Maltese; Animation by Richard Thompson, Ken Harris, and Ben Washam; Layouts and Background by Philip DeGuard; Film Editor: Treg Brown; Musical Direction by John Seely. 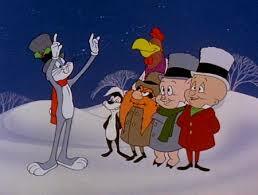 A Looney Tune released in 1958. Going to be gone the next week, and I’m yet to prepare. So I need a short I can talk about fast. One with little plot. A Roadrunner short works. 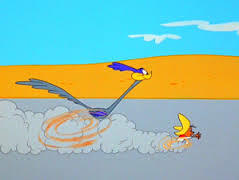 This was my favorite Roadrunner short as a kid, and never being able to catch its name, I never knew if I was going to watch it or not whenever I’d see one of these shorts. What made it my favorite? I’ll get to that. Shoots a slingshot, which knocks over a watering can, that empties its water on a flower, causing it to grow, allowing the match on its leaves to strike a match box and ignite an explosive, which fire a boot with a brick through the air, which lands on a lever, whose other end lifts a trap, which releases a mouse, who runs to some cheese on a scale, pulls it off, which lowers the other end with a weight, that slides off, and is attached to a gun’s trigger, which fires the gun, which ends up shooting a cannon, that bends down and lights its fuse, which fires a cannonball, that the Roadrunner watches fall, onto the Coyote’s head. The End. Would I still consider this short my favorite? Probably not. The ending is still fun to watch, but one good joke does not equal perfection. I’d probably choose the first one: “Fast and Furry-ous” There’s just some magic in that one. Maybe because it was meant to be a one time thing. Good thing I enjoy all subsequent shorts too. Wile E. heads out of his lair with some type of contraption in tow. It turns out to be a portable elevator which he uses as a way into Bugs home. He comes out with Bugs literally in the bag. Bugs asks what is going on. Wile E. explains and also tells Bugs (who is in the middle of escaping) that since he is a genius, he knows that Bugs was going to ask what was in the bag, Wile E. would tell, and Bugs would then say nothing is in the sack. As it turns out, Bugs says there IS something in the sack and Wile E. humors him by taking a look. It explodes. 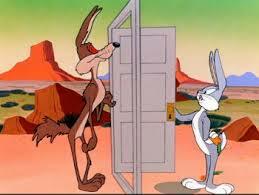 Bugs takes the elevator back down and Wile E. chases after him. Not noticing the TNT Bugs has left in the lift. BOOM! Time for the brains to be used. Wile E.’s latest gizmo is a Univac Electronic Brain. (UEB for short) You just enter your problem and it will offer you the best solution. He enters the animal as “rabbit” (was one of those options dad?) location as “hole”, and what as a “combonation lock.” The machine tells him to use burglary methods and even prints the code for the lock. (Wow. I need me one of those) Wile E. heads out at night with a portable window he puts up next to the lock. (Of course it’s nessesscary) Bugs, reading in bed, can hear him and casually tosses a banana peel into his path. He slips and lands in the coyote disposal which throws him out off the side of a cliff. Come morning, he asks what to do while Bugs is putting carrots into the toaster. It reccomends substituting the veggies for grenades. He does so, but the spring of the toaster needs work as it launches them right back to sender. Simply asking “what”, “now”, and “?” it suggests using a plunger. Wile E. has clearly been working out, as it creates a LOT of suction. So much so, that when Bugs puts a pipe out the other way, Wile E. gets sucked through it and into the plunger himself. 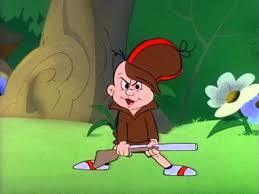 Next, Bugs is vacuuming and Wile E. places a TNT stick into the machine. This probably would have worked if he hadn’t done it just as the rabbit was finishing. Then maybe he wouldn’t have emptied the bag right away into the trash can Wile E. was hiding in. He then sets a booby trap in the carrot patch, that will go off and laucnch a boulder on Bugs when he pulls a certain one. (Can carrots grow in the North American Southwest?) Of course, nothing happens until Wile E. touches the snare himself. Rushing back to the UEB he asks for a suggestion, and it flat out tells him to go back and get hit. (which he does) As the short ends, we see that the UEB only has one moving part: Bugs himself.